As Nancy introduced, this is the fourth and final post in our Spring WCTF Blog Series, Achieving Impactful Outcomes: Observations from WCTF. In today’s post, CommCorp Senior VP Rebekah Lashman will explore the characteristics of successful sector partnerships. Partnerships that focus on specific labor market problems develop more effective programs. They are more likely to invest in continuous improvement and are in a better position to meet additional needs of the targeted industry. We suggest that partnership members pick a single occupation (or a closely-related set of occupations) for which there is clear evidence that there is current and near-term (one to two years) demand for workers. Last month my colleague Theresa Rowland and I had the privilege of offering a workshop at the Commonwealth Workforce Coalition Conference. We shared some resources for identifying an occupation and included a guide to interviewing regional employers about occupational demand. We also suggest that partnerships focus on a target population around which they will design the program. The most successful industry sector programs address the intersection between the skills and knowledge required for an occupation and the experience and skills that are attainable for a target population within a reasonable timeframe. Click here for another resource where we share some additional thoughts about how to approach this analysis. We’re all crazy busy and are feeling under increasing pressure to do more with less. No one, whether they work for a non-profit or public agency or a private organization, will remain committed to and engaged in a group for very long if the work isn’t aligned in some way with the mission of their organization and if they don’t have relevant resources or expertise to contribute to the group. There just isn’t enough time in the day or week. Every member of the partnership should be able to articulate what they or their organization will gain from participating and what they are bringing to the table that is essential for success. In our RFPs we always insist that a sector partnership include businesses that have a current and likely ongoing need for workers in the targeted occupation. The business members have the most information about the skill requirements for the occupation and about hiring practices and organizational culture. They should certainly participate in the program design and can often play a role in instruction, particularly if they can contribute a skilled worker who also has been trained in effective teaching methods. But there are many other areas of expertise that are essential for an effective industry sector program and are not likely to be in a business member’s wheelhouse. These include recruitment, assessment, social services, case management and career coaching, work readiness skill building, contextualized literacy, numeracy, English-language proficiency, and job development. 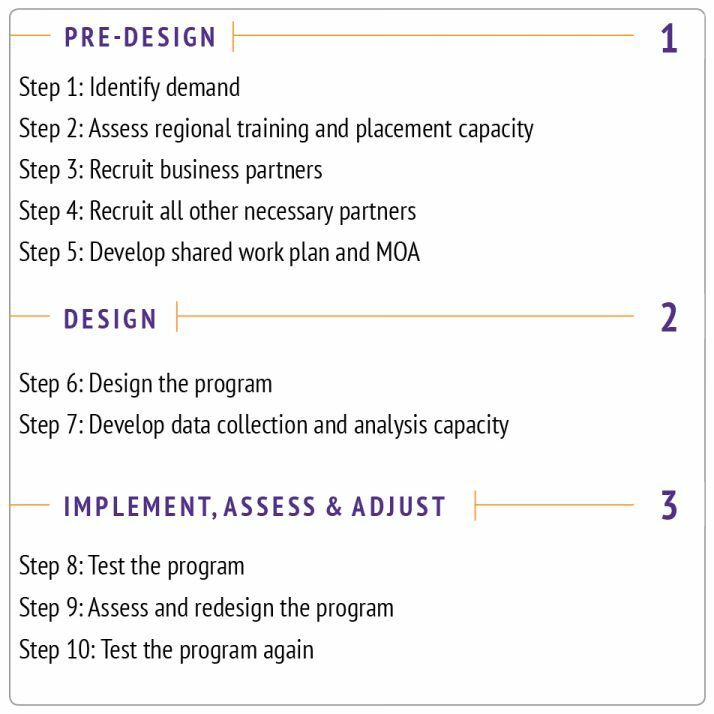 We’re currently working with eight partnerships whose members are engaged in a rigorous program design exercise in which they are assessing and revising every element of their programs to ensure that they meet the requirements of their target occupations and the needs of their target populations. We’ve been learning along with them – our colleague Anthony Britt discussed the essential elements of program design in his blog in May. We’ve also developed an outline of the phases of industry sector program development and some suggested steps. As you can see, we believe that it is almost impossible to overestimate the level of effort and investment required to conduct effective program design and delivery. We suggest that throughout the design process partnership members conduct an extensive inventory of the expertise, capacity and resources needed to ensure that the partnership has the collective capacity to be successful in designing and carrying out the program. Over the years partnership members have told us they are most effective when they are clear about what they have committed to do, what role they are playing, how decisions will be made and how they will know whether their program is successful. It is essential to identify an organization that will serve as the convener and staff of the partnership. We discussed this in our Partnership Guide in detail but the most critical capacities for the convener include relationship management, participant-level data collection and analysis and fiscal and project management. We also believe strongly that members should develop a shared program development work plan and an MOA that articulates the role, responsibility and resource commitments of each member of the partnership as well as the decision making processes. Finally, as Theresa suggested in her blog in April, the work of industry sector partnerships must be data-driven. The members should insist on, and commit to participating in, a continuous process improvement cycle. In order to do this, they will need identify the data required to assess the effectiveness of each program element, develop data collection and analysis capacity, and establish a schedule and protocol for reviewing the data and revising the program as needed. None of this is easy. After all, industry sector partnerships are coming together to solve labor market problems. But we believe that it is essential if we are to be successful in ensuring that Massachusetts’ residents are prepared to meet the talent needs of our state’s businesses. What has your experience taught you about industry sector partnerships? Please contribute to our ongoing efforts to share lessons and effective practices. Written by Rebekah Lashman, Senior VP for Sector Strategies at Commonwealth Corporation. Rebekah leads the design of CommCorp’s investments in sectoral employment and skills upgrading programs including the Workforce Competitiveness Trust Fund and the Workforce Training Fund.